A second medical opinion gives you certainty! If you discover any of these symptoms, it is important to have the symptoms clarified by a breast-health expert, without hesitation! Causes can be normal cyclical changes, hormonal disorders, inflammation, cysts, benign tumors, but also cancer. The probability that it is a benign change is far greater than that of a breast cancer. A breast cancer usually causes no pain or other typical symptoms, especially in the early stages. There is also the danger that the disease will be recognized late. Regular checkups are therefore an important tool in the fight against breast cancer! Modern ultrasound examination in the doctor’s office. Breast ultrasound (sonography) is a quick and effective method for clarifying chest problems. Sonography allows the breast tissue to be visualized and assessed using ultrasound on a screen. This enables the detection of a possible breast cancer. Unlike many other imaging techniques, no X-rays are used here. Therefore, this investigation is feasible at any time. In my practice, I use a state-of-the-art ultrasound device with high-resolution transducers, which is indispensable for breast diagnostics. 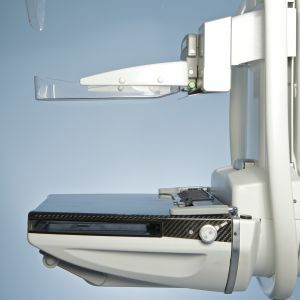 Mammography is a method of choice in breast cancer screening (breast screening) – it uses an X-ray to produce images. The breast is compressed as much as possible between two plexiglass discs and transilluminated from top to bottom and from the middle to the side. Some women find this uncomfortable or painful, others find it unproblematic. The examination takes only a few minutes. In some cases, mammography is performed in women under 40 as a supplement to ultrasound; for women over 40 years old, this is always performed together with ultrasound. In my practice, no mammograms are created. If a mammogram is necessary, I recommend nearby, established X-ray clinics. The pictures are then read, explained and discussed with you in my office. Here too, I draw on my well-founded, specialized training and my many years of international experience as a specialist in breast cancer diagnostics. I'm really glad that I asked Dr. Bernathova for a second opinion on my findings! She is a true specialist in her field. This step has given me great security.